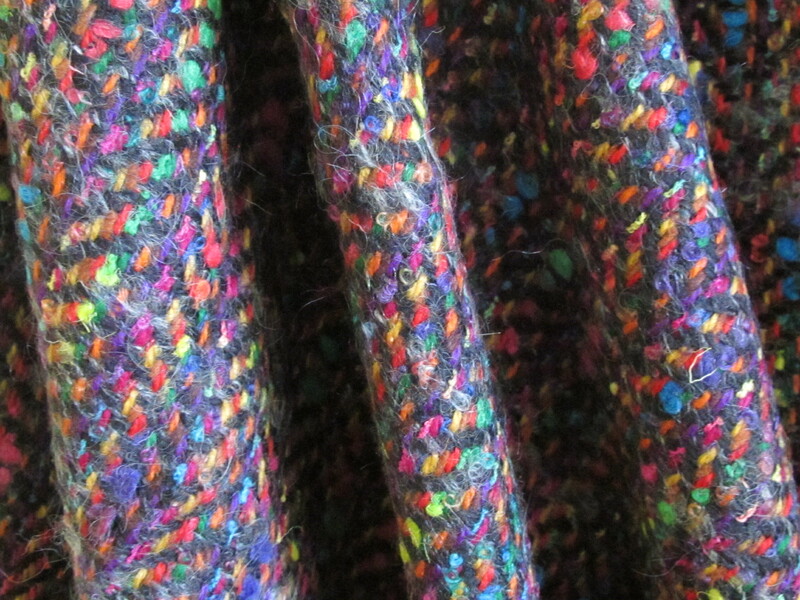 I bought this length of brilliant tweed boucle wool in Florence quite a few years ago. It has been lovingly packed away in tissue and wrapped up carefully, but now the time has come to see if someone else might like to give it a home. When I spotted this fabric I both swooned and cursed at the same time. Possibly one of the worst things to buy at the start of a month plodding around Europe in summer with what was then a 20kg luggage limit is a length of a woollen fabric. 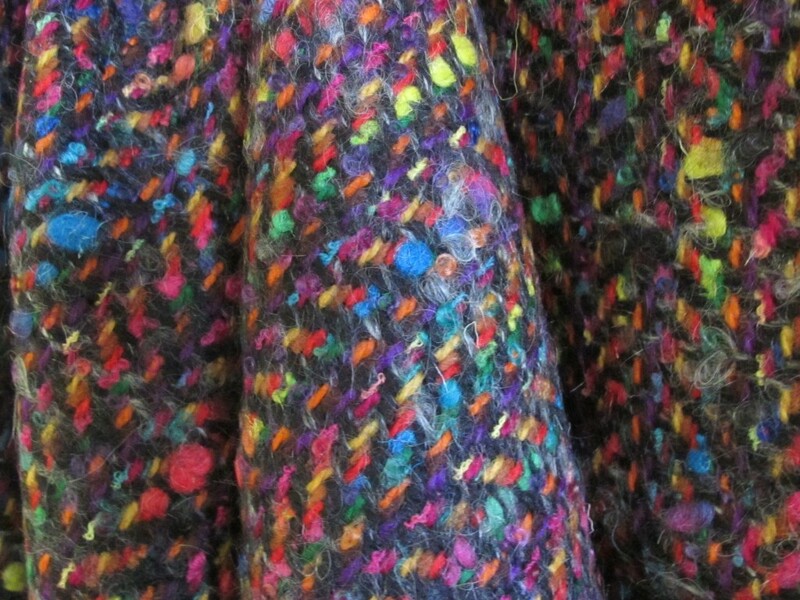 But I was so absolutely captivated by this wool that I knew I had to bear such a burden and bring it home with me. The weave is just incredible. 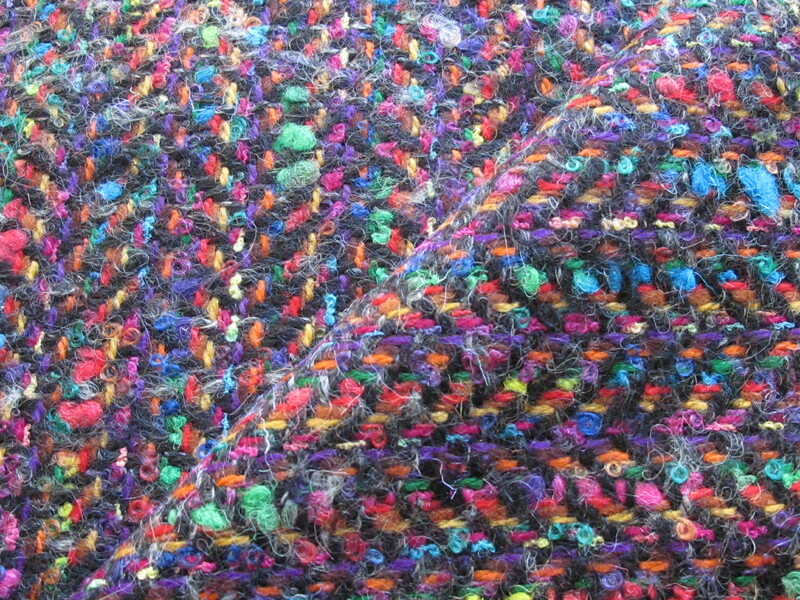 The dark base colour is charcoal and then woven and warped through this are thick and thin yarns in a rainbow confection, creating the most dazzling kaleidoscope of colours. Greens, purples, pinks, aqua, red, orange and yellow – strong primary colours – are tempered by the dark charcoal base, with these occasional punctuations of nupp-like effects in the weave. 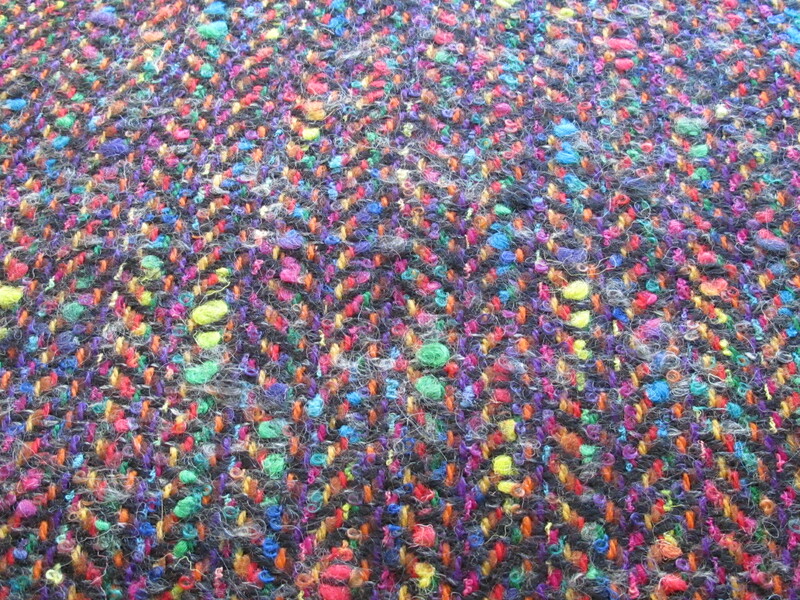 The weave is compacted so it is a stable tweed/boucle woven fabric. And it is a thicker woollen. This fabric would probably best lend itself to garments without lots of finickity pieces that create lots of seam allowances banging into each other, though expert seam allowance graders would sail through more detailed constructions. Outwear, jackets and vest would all be ideal. The fabric would probably be too thick for a skirt. The fabric width is 146cm and the length is 2 metres. I paid what was a small fortune for fabric at the time…still is actually a lot of money for a fabric, about $75 a metre. I have been offered this amount 5 times over to part with this fabric but never wanted to let it go. But, I am going to mark it down now because I have been marking down all my fabric and because I want to keep them moving along now. So I am asking $47 a metre/$94 for the piece. I will need to send this fabric in a medium satchel for $13.40. Please see here for further information about payment and post. If you are interested in the fabric, please click in the email link at the bottom of this post. The fabric name will come up automatically in the email header so I will know which one it is. And I will get back to you as soon as I can. 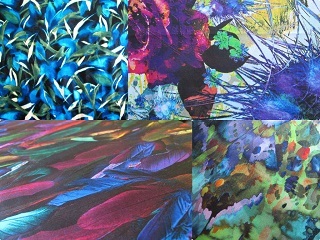 (At this time, I can only offer the shipping of fabrics within Australia, sorry).